I saw a tweet from the National Museum of the Philippines (@natmuseumph) that says that their entrance fee for this month is FREE! (oh yeah!). This is a rare opportunity so I grabbed it. I visited the museum last week. The free entrance fee was part of the Museums and Galleries Month celebration and can be availed until October 31. Anyone can freely enter its two buildings one of which holds artworks from the Spanish Era to recent times. The other building holds the archeological artifacts unearthed in the Philippines. It is the first building that I visited. I was immediately amazed the moment I entered the museum. I felt transported to another era. That is just the beginning because I became more amazed when I entered the first gallery. My eyes fell upon a painting that I usually see in textbooks and the Internet. Juan Luna’s magnum opus: The Spoliarium. I didn’t expect that this painting would be so big. Standing in front of this painting is much better than viewing its photos and replicas. Spoliarium is not the only artwork that made me say “wow”. Each gallery that I visited in this museum has at least one painting or sculpture that caught my attention. The National Museum of the Philippines was established in October 29, 1901 during the years of American Occupation as the Insular Museum of Ethnology. Its main function is to serve as the repository of historical and archaeological artifacts and show them to the public. The museum currently has three buildings housing the National Art Gallery, Museum of the Filipino People, and the National Museum of Natural History. The National Museum also operates the Planetarium located in Luneta Park. 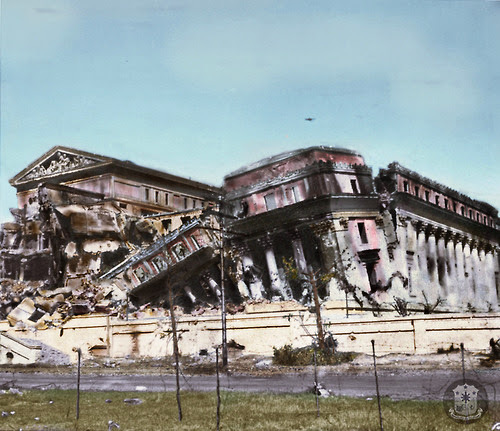 The legislative building (now known as the National Museum) damaged during the War (Source: Malacañang website). It shared the same fate as the Manila Central Post Office as it was damaged during the Liberation of Manila at the end of the Second World War. Fortunately, the building was not levelled by bombs thus it was easily restored after the war. After housing the Philippine Congress, the office of the Prime Minister during the Martial Law years, the office of the Vice President, Senate, Sandiganbayan, and the Ombudsman; it was turned over to the National Museum in 1998 for the centennial celebrations of Philippine independence. The National Museum, or particularly the National Art Gallery, is located just few meters away from the Manila City Hall. It can be reached by riding any jeepney or bus that will go to the city hall. Refer to the map above for directions. Thrill seekers will find the National Museum’s art gallery a boring place because it only contains paintings and sculptures. But since I’m a self-confessed history enthusiast, I consider my visit an adventure to the past. The National Art Gallery is composed of various galleries that displays artworks from the Spanish Era to modern times. Of the many names of Filipino artists that I read in the museum; the ones I know are Juan Luna, Napoleon Abueva, Vicente Manansala, Carlos “Botong” Francisco, Fernando Amorsolo, and Guillermo Tolentino. (Yeah I know, my knowledge of Filipino arts is very poor). Tinikling by Fernando Amorsolo on display in the National Museum. I found the National Art Gallery a good place to compare the classic style to modern style of artworks. In my opinion, the painting using the classic styles are much better than the modern style. I find the abstract art (one of the modern style of painting) chaotic and ugly. I prefer that humans look like humans instead of being presented as just squiggly lines. Despite of this, there are some modern-style paintings displayed in the museum that I liked like the Sarimanok of Abdul Mari Imao. Of the many galleries inside the National Museum, my favorites would be the galleries containing old Catholic arts and the paintings depicting the Basi Revolt in Ilocos. My first favorite gallery reminded me of my visit to the [name of meum in Cebu]. This gallery is field with old images of saints, religious paintings, and even old retablo (altars) from various churches around the country. Saints Francis and Dominic with missing hands. I noticed that most of the old sculptures of saints in the National Museum have missing hands. I am not sure but I believe that the hands were made of ivory or gold and were cut off by thieves. Other images in San Agustin Museum and other churches experienced such desecration from thieves. My second favorite gallery contains 14 paintings depicting the climax of the 1807 Basi Revolt in Ilocos. I liked it because it gave me a view of one of the largely ignored part of Philippine history. In fact, the Basi Revolt occupied just a few sentences in our high school history books. Colonial government soldiers and Ilocano revolutionaries fighting at the banks of Bantoay River. Much to the envy of Andres Bonifacio and others, Our National Hero has his own gallery in the National Museum. The gallery showcases some Rizal’s artworks, and paintings and sculptures made by other artists. Of all the artworks inside this gallery, my favorite would be the El Edillio un Azotea by Roman Faustino. Aside from the Spoliarium, the National Museum also displays another Juan Luna’s work: the Parisian Life. I didn’t know about this painting until one of curator said that they have the “controversial painting”. The Parisian Life became controversial because it was purchased by the GSIS for 25.4 million pesos. GSIS was criticized because of this because (as the critics said) GSIS has no right to use its funds to acquire works of art. Of all the paintings that I saw in the National Art Gallery, my favorite would be the Dead Child painted by Simon Flores in 1896. I was drawn to the peaceful expression of the child. Maybe he died peacefully? The paintings and sculptures that I posted here is just few of the scores of photo that I took during the whole afternoon. Unfortunately, the space for this post is limited so I cannot post them all. Maybe I’ll share those paintings in the future blog posts. There were few visitors during my visit to the National Museum that afternoon. I saw at least two group tours and one school field trip but they didn’t crowd the place. The curators said that weekdays are the best time to visit to avoid the Saturday and Sunday crowds. The entrance fee of 50 pesos will give you access to all the galleries of the National Art Gallery. Entrance fee is free during Sundays. Taking of photography is allowed but the use of flash is prohibited. Curators strictly enforce this rule to prevent the deterioration of painting. In fact, a curator asked me to stop taking photos because my camera emits a strong light. I was allowed to resume photography when I covered the light with my handkerchief. Touching any artwork is prohibited. Bringing in food and drinks, and pets is also prohibited. The whole afternoon was enough for me to visit all of the galleries. And, mind you, my time in each gallery was not rushed. I took my time viewing the artworks until the closing time at 5 PM. I am glad that I was able to Visit the National Museum. It was like being fed with sumptuous food course after course. The only difference is that at end of the afternoon, my feet were aching and my stomach is growling but my mind is satisfied. 1. Price of the Parisian Life was obtained from the article "The Cost of Saving Our Cultural Heritage" by Bienvenido Lumbera at the NCCA website. 2. The history of the National Museum (old legislative building) was obtained from the NHI marker on the wall of the museum. Lovely building, inside and outside. My girl would love to visit - she loves museums. Very nice statue of Mary, makes one think what she's thinking. I am not sure if that's Mary. I forgot the name of the that sculpture. I would like to link this/your post about the National Museum in my blog. The goal is for other readers to also check the other articles written or other photos taken by other bloggers. You don't have to do the same if you don't feel like it but if you want to add mine or links from other bloggers, that would be great. Let me know if you permit me to link yours in mine. PS: If you're a Filipino blogger, you may want to join the Philippine Bloggers group in Facebook. . Know more about it in this link.. Thank you very much for the visit. I hope that this will be the start of our online friendship. Oh it's free entry? That's really good! I didn't know strong light will damage the paintings. It free for the month of October only. Strong light are bad for old paintings because it causes the paint to fade. Beautiful!!! I sure would want to go there. Don't remember visiting it in 1981 when I went to Manila. You must visit our National Museum especially if you want to know about the Filipino culture and history. Believe it or not this is still on my bucket list. Soon! Sana mapuntahan mo na nga ito. The National Museum is renovated now! Never thought it look odd on the outside years ago, haha. Nice blog, btw! !